Wherefore the young rebels made war with the Establishment and there was a mighty battle. And the ranks of the elders fell back in a hail of obscenities, for the young men had fashioned a deadly missile which they made in this wise: they gathered together the chronicles writ in the Underground Press and forged them into a fiery weapon which speweth forth a foul stream of profundity. And they called it the F Bomb. This little 45-page-long satirical booklet is a beautifully weird political artifact of American history. Published by Triad Books in 1970, with the dust of the dying hippie movement settling over the land, it chronicles the political and culture war of 1960s America in overly serious language, as though a book of the Holy Bible. The book is satire that would probably never find an audience today because it takes aim at all sides of the battle. It makes fun of the Students for a Democratic Society (part of which evolved into the Weather Underground domestic terror organization) just as much as it rips on Nixon, Spiro Agnew, and even Doctor Spock. Or, so it appears to me in my reading. I can’t detect any one position that’s being favored. Everyone is equal game for ridicule. I guess only South Park could be evoked as a modern-day source of such equal-opportunity satire. I discovered the book at the Friends of Sequim Library book sale last summer, along with several other nuggets of weirdness of which I will soon share. 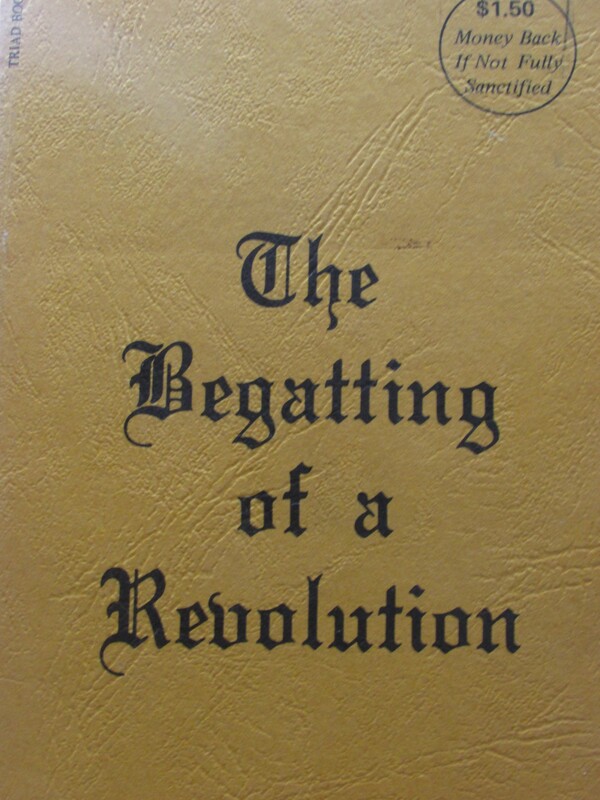 I’ve been able to find little information about The Begatting of a Revolution, other than that the authors were associated with a 1970 album titled The Begatting of the President (the script was also published by Ballantine Books in 1968). History refresher: The president at this time was Richard Nixon, one of the most controversial presidents in history, and the man leading the nation while it raged in a veritable civil war of ideas and culture. Beyond Watergate and his impeachment (look it up, children), Nixon was implicated in all kinds of shady activities throughout his tenure. COINTELPRO is one of the verifiable aspects of this history, though it should be noted that much of the accusations against Nixon had little to no weight behind them. I didn’t actually know this, myself, until a couple years ago. It’s been part of my continual education in the fact that people raise or lower their standards of evidence depending on how things reflect upon their preferred political ideology. The album was narrated by none other than Orson Welles. Welles was audited the very next year, with many believing an angry Richard Nixon was retaliating against him for this album. There’s little evidence for that claim, but that certainly doesn’t mean it’s impossible. Some of the claims against Nixon were proven, some were a bit paranoid, but ultimately, I think there’s little doubt that he was at least potentially capable of such a thing. The book identifies co-author Sasha Gilien as a “television writer and novelist.” His IMDb page identifies him as a writer of episodes Hawaii Five-O and The Big Valley. The Alfred Hitchcock wiki identifies him as having written A Transfer in the Bronx, a short story in Alfred Hitchcock’s Mystery Magazine. Myron Roberts was a college professor, a writer, and the editor of Los Angeles Magazine (which still exists today). My favorite section of the book is the Proverbs section. Here I think the authors are having fun but also show their hand more than at any other point in the book. and a nation filled with self-righteousness (bolding is mine). That last sentence, in particular, makes me a fan of this book (though I’m not entirely sure if my interpretation is what they intended). I take it to be a statement on moral arrogance in general. Extreme Righties, extreme Lefties, whatever. Or maybe I’m projecting, because I find extreme Lefties and Righties to be equally absurd, so I don’t know. Regardless, this is a fun book, and I was thrilled to find this weird historical gem hiding in the Seqium book sale. I’ll finish this up with what I consider the finest wisdom in this funny, satirical book. It’s food for thought for all, I believe. Who so burneth a college, shall be consumed by ignorance. Jeff Suwak has been called “devastatingly handsome” and “peerless,” but only by himself. Most writing archived at http://www.beyondthetempestgate.com/.